Control your lights with your smart phone from any place, at any time! Use Magic Home Pro app (iOS and Android) to control up to 5 channels of LED lights. It can control any of the following formats: 3-channels RGB, 4-channels RGB+White, 5-channels RGB+White+Cool-White. HTW400BWF is plug & play ready for all Cyron lightbars. Supplied with DC jack for power connection and a six port hub for connections to Cyron lightbars. 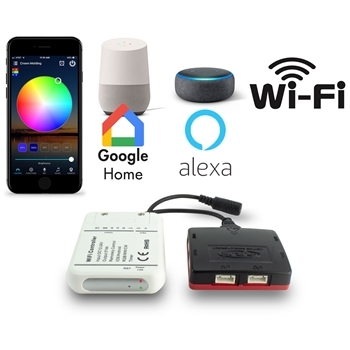 Use Magic Home Pro app (iOS and Android) to control up to 5 channels of LED lights. Sound Mode - The lights in this mode will react to your voice.